It's one of Clinton Kelly's recipes from The Chew. He demonstrated it as a side for seared trout - which I'm certain is delicious. But I didn't make the trout. Just the SO GOOD salad. That's what I should call it. I should make them together. Then when people asked what I made for dinner I could say GREAT SOUP and SO GOOD SALAD! Actually GREAT SOUP is kind of for winter. And SO GOOD SALAD is definitely for summer. So they will probably never meet. You're going to have to hurry and make it before cherries are completely gone from the grocery. Heat a drizzle of olive oil in a medium saucepan over medium heat. Add the quinoa and toast, stirring frequently until fragrant and nutty, about 2-3 minutes. Add the water and a pinch of salt to the quinoa. Bring to a boil, then reduce heat to low, and cover. Cook until tender - about 20 minutes. Fluff quinoa with a fork and set aside to come to room temperature. 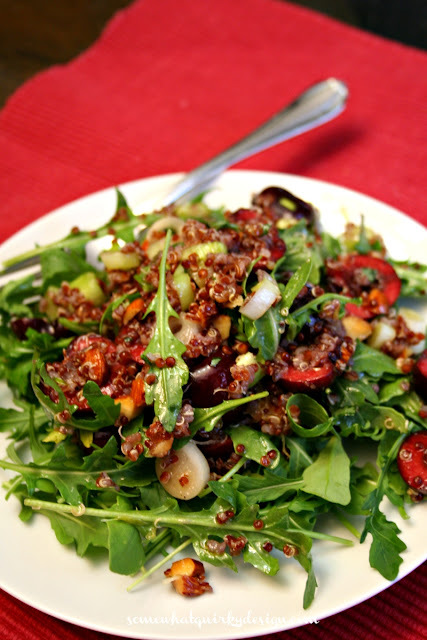 To a large mixing bowl, add the quinoa, cherries, toasted almonds, scallions, arugula, tarragon, the juice of half an orange, honey and olive oil. Toss to combine. Season to taste with salt and pepper. This recipe serves 6 as a side. Sometimes Mr. Quirky and I eat the whole recipe as dinner. When we do this I put a layer of arugula on the plates before I add the mixed salad and double the almonds. If you don't know how to toast almonds here's how: spread almonds on a cookie sheet and toast in a 350 degree oven until fragrant and color starts to appear. Don't burn them. That will just piss you off. So. Hurry up and make this. *Update! 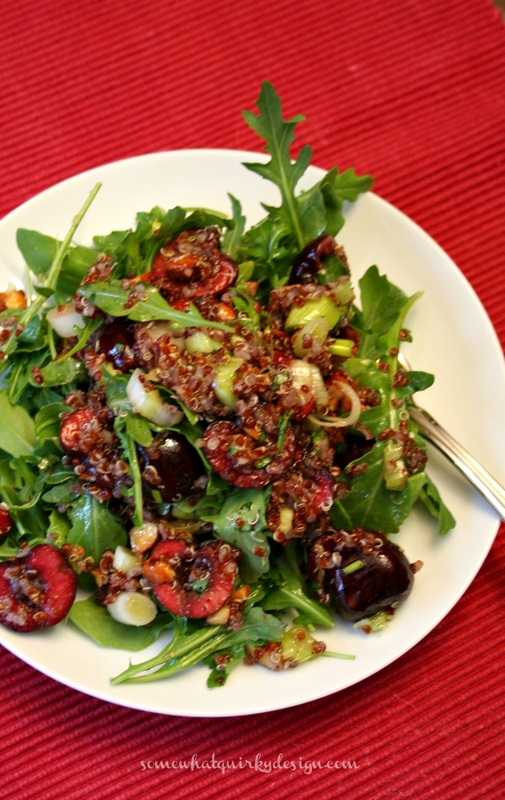 Since cherries are so seasonal, we've done a bit of experimenting with this salad. I've tried it with cubed peaches and with dried cherries. Both were good. Not quite as good as cherries but almost as good. The sweeter the peaches are the better. I am pinning this recipe. I have enjoyed all the different quinoa salads I have eaten, but never thought about making one. No cherries this year! Such a bummer. But boy, we sure do have a plethora of peaches! I need to find a peach salad. Will pin in morn. So I don't cook the quinoa before toasting right?